An abundantly hirsute, wizard-like, quirky-looking gentleman named Jorn Barger is the person responsible for originally coining the term "weblog" in the 1990s. I know this only because Barger, one of the web's original bloggers if not the original blogger, also has a reputation for having written heaps of enlightening material on James Joyce at his early weblog "Robot Wisdom." Navigating through the many dead links one might expect to encounter on a site that hasn't been updated since 1999, you'll find a vast amount of material including original (sometimes groundbreaking) analysis and exegesis of virtually all of Joyce's work. But that's not all Barger ever wrote about and this post is not about James Joyce. This is about life's propensity to ricochet experience into unforeseen directions. See, my girlfriend and I have decided to call it quits after three mostly wonderful years (living together for much of that time) and these last few days have been painful ones for me but the experience of prolonged sadness has led to a number of interesting experiences. So I'd like to take a Jorn Barger-inspired trek through all of that right now. Besides writing massive analyses on Joyce, Barger was an expert on a few other things including artificial intelligence. A brilliant mind, Barger was a software programmer during the earliest days of Apple in the 1980s and later brought his computer programming skills to Northwestern University to engage in artificial intelligence research. Starting in 1995, he assembled a blog with essays, explanations, and other resources covering Joyce, Artificial Intelligence, history, the internet, technology and many other things. One thing he wrote a little bit about, and which I just recently read with great interest, is a scientific hypothesis on ESP or extra-sensory perception. After briefly outlining his intellectual track record (perfect score on "World's Hardest IQ Test," etc.) to lend his ideas a modicum of authority, the author conveys his "rather unconventional approach" to snowflake symmetry and atmospheric physics. At the other end of the emotional spectrum is the phenomenon of musicians getting into a groove, which could easily turn out to be a literal state of resonant vibration. There's a sense that these phenomena are less effective with increasing distance (some people you can't wait to get away from! ), but there's a related set of phenomena that seem to take place at a distance... Especially if you've been close to someone, you seem at times to feel their emotions at a distance-- especially if they're angry with you. These atmospheric tensions not only resonate as vibes in a room but can also come across in sounds and here's where it gets really interesting. Someone comes into the room behind me and trips over a chair-- even that 'random' sound can convey plainly whether the tripper was angry or not. Angry crashing usually sounds very different than non-angry. This last example of the clanking dishes is something I've experienced very often while sharing a living space with a girlfriend these last few years. Numerous times she's accused me of purposely making a bunch of noise with the dishes out of anger and I've blamed her for the same. From my personal experience, I wasn't making any more noise than usual but the dishes could probably just feel that I was pissed. This is all resonating in my mind because there's been much tension in my apartment the last few weeks. As I've said, my lady and I are splitting up and she's moving out but we've shared the same space the last few weeks knowing it was going to end. When her mom visited and stayed with us two weekends ago we mostly had a good time except for a little brouhaha on her final night staying here. Her mother was sleeping on my couch in the living room where the air conditioner unevenly makes it cold while our bedroom stays warm. Her mother and I had been down this road before, having disagreements or arguments about what temperature to keep the A/C at or whether to have it on at all when she's stayed over even at our last apartment. One night I came home late and the A/C had been turned off completely which bothered me. Then on her final night here, after my attempts to find a temperature pleasing for all failed, I tried opening our bedroom window to relieve the oppressive heat in there to no avail. So I put the A/C on full blast. At about 4:30 in the morning her mother threw a fit (without a word, except for arguing with my girlfriend in French) slamming doors and leaving lights on to try to wake---and rile---me up. Ever since then, the air conditioner has made a loud knocking noise whenever it comes on. It sounds like a heavy fist punching the wall. The apartment maintenance guy came and made some adjustments but generally didn't see anything wrong. The A/C works fine, it just makes a loud knock every time it starts and a strange jangling every time it stops. The argument between Freud and Jung was over Jung's concept of synchronicity, a term he originally introduced in a foreword he wrote for Richard Wilhelm's translation of the I Ching. I've consulted the I Ching on and off for about five years now, always finding it most handy and worthwhile in moments of crisis or stressful transition. Often referred to as "The Book of Changes," the I Ching is perfect for such moments. Splitting up with the woman with whom I've shared my life for the last 3 years, sharing a home for two-and-half of those, has been a terribly stressful and painful experience. We officially split last Saturday and it's been probably the roughest week of my life. I've felt like a part of my body was amputated with no anesthetics. As an example of the very real phenomenon of synchronicity and how it informs one's use of the I Ching, I am going to share with you what the book (more accurately called an "oracle") told me when I consulted it for a flicker of wisdom in this stormy darkness. The way one uses the I Ching is to ask it a question, then, to receive an answer, simply generate two numbers randomly, both of them between 1 and 64. There are a number of ways to do this but I used an iPhone application featuring Brian Browne Walker's translation of the book. When I asked about my distressing situation, here's what I got. The transition from chaos to order depends upon your achieving true inner calm. The image of the hexagram is that of spring, when "the darkness and decay of winter are about to give way to the light and plenty of summer." The transition depends, though, on one's being able to strengthen "clarity, calm, and conscientiousness." The hexagram advises against reacting to outer pressures with the ego "by worrying, desiring, or becoming aggressive" all of which I've been doing since my baby left me ("Heartbreak Hotel" is playing at the coffeeshop right now as I type this). The key is to abandon "the hysterics of the ego" in favor of "acceptance, modesty, and inner balance." In a very real sense it can be said that the state of the world depends upon your thoughts and conduct now. The external world will only come into order if the inner world has done so. And so it is imperative that I can calm down my ego's worrying and proceed "like a fox walking on ice: cautiously, deliberately, and gently. By persevering ... you build the foundation upon which good fortune rests." The simple truth is that every moment in every person's life contains the teaching he or she needs at the time. It is not always immediately apparent why a thing is happening because the Sage is often inclined to work in a roundabout fashion. Nonetheless, whatever is happening now is what must happen. Our only task is to trust the process and allow the lesson to seep in. Don't pretend you can't see the darkness. Admit to its presence. Accept its reality. And then, walk nonchalantly away from it, refusing to fight it or be afraid of it. In other words, face up to the difficulty without becoming all tangled up in it. Gaze into the abyss so as to educate yourself about its nature, but don't get stuck there or become entranced by its supposedly hypnotic power. I think you'll be amazed at how much safety and security you can generate for yourself simply by being an objective, poised observer free of melodramatic reactions. This resonates with me, believe it or not. As just one example, a friend who has had a bonafide terrifying and tragic experience told me that she had recently read her own Tarot cards, and the reading gave not the slightest glimmer of hope. But after we talked about it, her words were similar to that I Ching reading. It's something about accepting the darkness and the abyss instead of seeking to escape it, or deny it. Still, I'm glad I didn't get that reading and I empathize with all who have to undergo this extreme version of reality. I can't quite resist double posting to say that as soon as I finished here, I turned on a VHS tape a friend had lent me. It was for a TV show, but the ad in between was for a Minnesota art project and the guy talking was showing off his art pieces, which were based on, you guessed it, the I Ching. The first piece he showed was of a burnt ukulele (I think), which was all that was left of his friend's burnt out house. He had used the fret work to make an I Ching figure and the background to make a changing figure. His art, in fact, all used the I Ching. Double comments are doubly welcome, Seana. My grey clouds have already begun to dissipate after a stormy week and I'm starting to see the bright sun on the horizon. 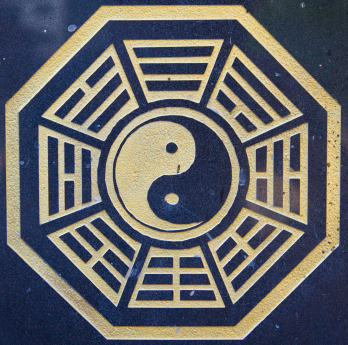 As with Joyce's work, Robert Anton Wilson, and anything else that deals closely with synchronicity, the I Ching seems to encircle one into a web synchronicities. Thus, your remarkable coincidence is almost to be expected. Apparently this must be true, because I've had two more odd I Ching encounters since I wrote. Not super odd, but odd all the same. Glad to hear the sun is coming out. Did you catch the transit of Venus?